Andrew Coultas and Angela Tyler, Parish Councillors’, attended a site meeting on Friday 26th October with Herefordshire Council’s Highways & Transport to discuss the proposed cycleway along The Crescent, Roman Road. The plans propose to reduce the width of Roman Road to essentially slow traffic down along the section of the proposed cycleway/pedestrian way. The existing footpath will be widen and resurfaced to enable dual use with clear standing bollards and signs for cycling & pedestrian. The pedestrian crossing has been upgraded and marked clearly for pedestrians and vehicles. All overgrowth will be cut back and a clear white line will delineate private property to the adjoining cycleway/pedestrian use. Such road/cycleway/pedestrian works will not commence until the new link road between the A49 and Roman Road is constructed and in use. We envisage this to be about 18 months time. Parishioners are invited to have a look at the proposed plans which will be discussed at our next meeting on Monday 14th January 2019. Any comments prior to the meeting will be recorded and dealt with at the parish meeting as well as anyone wishing to speak on the said evening. Ref. 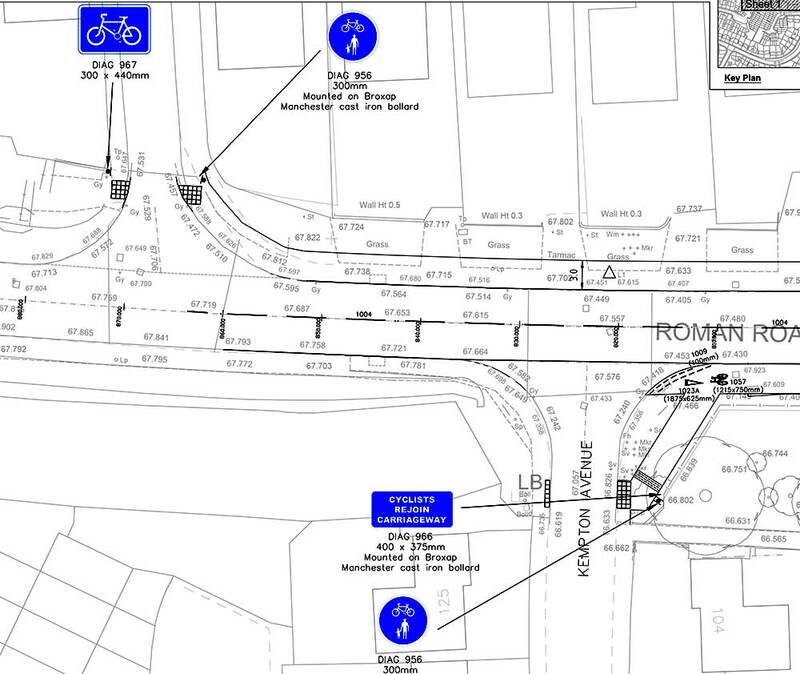 proposed Roman Road cycle-way. It was reported at the November meeting that there was to be clear segregation of pedestrians and cyclists but this is not apparent from the drawings provided. Even so, it does not require much imagination to foresee the potential for serious accidents occurring and it appears perverse that HCC is prepared to approve such a scheme, particularly since it fails to meet recommendations detailed in Department of Transport Note 1/12. Some months ago, when this was discussed with the then Head of Planning, Ed Thomas, he remarked that “you don’t want a cyclist sprawled across your bonnet”. In view of the likelihood of this occurring, if the scheme proceeds as planned, then residents must be indemnified by HCC for any financial costs incurred resulting from an accident. Complete waste of time for all of it, it will not be used, the whole idea for the requirements are fabricated.